Another ingenious Emrys Hopkins design makes the single switch a double-slip, which provides a very flexible shunting/switching layout in the tiny space of 36″x12″. In some ways Juster Yard provides a back-to-back Inglenook type design (see “Inglenook” for more on these designs). Hiding one of the legs behind a building or backdrop would allow you to use it as a fiddle yard/staging area, representing the rest of the world “off layout”. For more examples of Emrys’s layout designs see his excellent web page, LayoutDesigns.com. Apple Valley Light Railway Mk.I is Ian Holmes’s first version of his interesting and provocative idea to use a full train turntable in the center of his layout. This design idea is featured in a number of the plans on these pages…it saves tremendous amounts of space, yet allows reversing of entire trains, and with a replaceable cassette even allows you to swap out the consists running on the layout! Here, Ian hides the “traintable” behind a row of trees and a small office building. He has provided an engine house (loco shed), several works sidings for switching, a small passenger shelter, and the rudiments of a fiddle/staging area. He later developed this idea further to achieve the design he’s currently building (see “Other Good Ideas”). 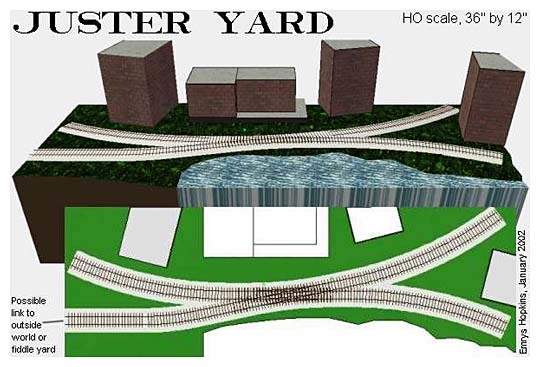 One of the smallest and simplest layouts in these pages, Morna Yard has a giant potential for operating fun! It uses a single three-way turnout to create an “Inglenook” pattern switching/shunting layout. In the space of an average bookshelf, Morna Yard provides an endless series of switching problems than can occupy any model railroader for hours. Basically, about five cars are distributed on two of the three side tracks, then sequenced by selecting tokens from a hat. The challenge is to marshall the cars in the designated order on the third track. Sound simple? Try it! You’ll be amazed at the complexities that can arise almost immediately! Jeff Hatcher revealed the plan of his “almost pointless” N scale shelf switcher, “Stubby Yard,” in Issue Number 38 of Model Trains International. It’s a very compact industrial shunting layout, using a traverser (transfer table). And it has all the earmarks of a micro layout, but is somewhat too large to fit the category (Jeff wasn’t looking to design a micro, just a good small layout!). Enter Stubbier Yard, a “squozed down” version of “Stubby Yard” that fits in 36″x12″ — very much a micro-sized layout. In HO, it’s designed to use 40-foot cars and a relatively small four-wheeled switch engine. There are five destinations for cars to shunt . Start with three cars on the backstage storage track, randomly select (from a hat?) destinations for all three, and proceed to distribute the cars, collecting any empties that may already be in place at each destination. You’ll find it a challenging exercise from almost the first move! Note that runarounds can be accomplished in a number of ways, all involving use of the transfer table. A Perfect “Starter” Micro Layout! Ian Holmes spent a rainy day in his workshop, creating this delightful little micro layout. He had a foamboard offcut that measured 22″x6″, so started arranging track pieces on it. Suddenly the plan took shape, and became Tennower Mine. Ian proceeded to build the layout to the point shown in the work-in-progress photo below within — you guessed it — 10 hours! The gauge is 16.5mm. Ian’s scale is Gn15, but the same trackage will work for 1n20, On30, or even HO standard gauge. In all scales, you’ll want to use a very small switch engine and some short four-wheel cars or wagons. The key dimension is the sector plate …. it must be long enough to hold the locomotive and one car — otherwise shunting will be nearly impossible. If you leave the back of the mine building open (at right), you’ll be able to swap cars in and out, load and empty them, and rearrange consists however you like. The basic operation is to push cars out from the mine building to the sector plate, which then switches tracks and allows the loco to pull the cars to the headshunt at right and push them into the coal yard track at the front left. Of course, the empties already in the coal yard will have to be moved out of the way first, then later returned to the mine. If you try to keep three or even four cars or wagons in play, you’ll have an absorbing time shunting them about the layout. All in all, Tennower Mine is a perfect “starter” micro layout. It’s small, inexpensive, uses standard HO track materials, can be made quickly, boasts interesting track formations and a sector plate to provide some construction challenge, and when finished it can be operated in prototypical and interesting fashion. Let’s see … in N scale it would measure something like 14″x3″. Unquestionably, you always have room for a small model railroad!